Manhattan by Sail: Group Sales and Discounts | All Tickets Inc. It is sailing season again, and this is the perfect time for your group to book an awe-inspiring sailing experience with New York’s premiere water carry that specializes in wind-powered travel on the water. 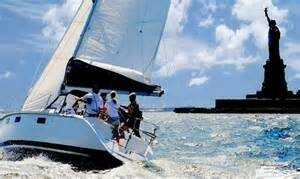 Manhattan By Sail offers a full range of amazing nautical adventures for your group. See the Island of Manhattan in a whole different light, from an entirely unique angle, and via an exciting and invigorating experience. A sailing ship offers your group a dynamic way to enjoy the waterways, historic landmarks, and the full natural beauty and manmade magnificence of the area. 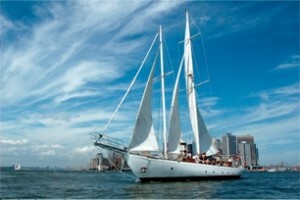 Manhattan by Sail has two wonderful sailing ships that your group can enjoy. The Shearwater is a classic schooner from the opulent Gatsby era. The 80-year-old vessel accommodates 68. It is a designated floating landmark of NYC. The second ship, the Clipper City, is a replica of a 19th century schooner. The 158-foot-long ship carries up to 150 passengers. Both offer groups breathtaking experiences. Enjoy a hefty brunch, sail around Manhattan at twilight, or travel around the Statue of Liberty and other NYC landmarks. The narrated tours offer groups a wealth of interesting information and are great for schools. 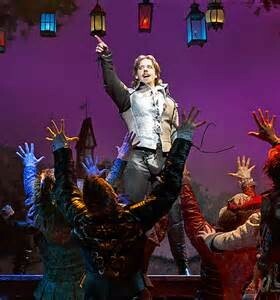 Combine this experience with a Broadway show and you’ll save more. 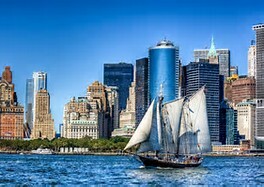 Take advantage of what Manhattan by Sail has to offer and combine it with All Tickets’ free group ticket offer for Something Rotten! or Finding Neverland. This is a time-limited offer where you’ll receive 1 comp ticket for every 25 purchased, when you book any other service or experience through All Tickets, Inc., such as Manhattan by Sail. All Tickets Inc. always offers the lowest possible group rates. We’ll go the extra mile to make sure that you get the most for your money, that you have a quality experience, and that you are completely satisfied with your NYC experience. Leave the hassle and frustration of coordinating your NYC group experience and contact All Tickets’ personable, professional group sales specialists. Call us today at 1-800-922-0716 for more information on Manhattan by Sail, our latest comp deal and everything NY.